UPROAR in the Skol house in north-west London on the last night of their six-day party. Five minutes to go until closing time. Your last orders, gentlemen, please! How about you, Mr. Post and your Belgian friend Monsieur Sercu. No more ? Well you've done very well indeed if I might say so, sir. Back in the summer we were all so upset when we heard how ill you were. Now here you are again and knocking them back better than ever, and with five inches of plastic tubing still inside you, too! And no more for you, Herr Kemper? Well, I am surprised. When I heard you were coming again, and with Mr. Post out of sorts, I tipped you to steal a march on him at last. But he's a round up on you again. We've got it all marked up on the board there. You've got through about the same number of rounds as our Swiss friends over there, old Mr. Pfenninger and his good looking young friend Erich. I reckon you'll end up second again Herr Kemper. That'll be the fourth time in succession at our little affair, won't it? But you, young Gowland - you've had enough. You've been giving me quite a bit of trouble all week, you have. Getting into that business on the second night of the party and having to have six stitches above your eye, and then throwing your weight about as if you owned the place. Have a little respect for experience, I say. But the customers seem to like you. Quite a favourite you are, in fact, but I mustn't let that stop me from being firm. I admire your pluck, though, trying to get up level with those gentlemen from Germany and Switzerland. But you're lying fourth on my board and that's pretty good if you ask me. You just go back and sit it out quietly with your boss Herr Renz. BUT there was time, and with Wembley's Empire Pool wild with excitement Tony Gowland was at it again, tearing round the 160 metres Schurmann-built track, handing over to his partner Sigi Rent, circling on the outside for a couple of laps' breather, then down again into the thick of the fight for another two rounds of concentrated fury. And there they were, level on distance with Kemper-Bugdahl and HenningerSpahn but with a higher points score. Tony Gowland and Sigi Renz, the team in the Union Jack jerseys were now second in the race, but still a lap down on the invincible Post-Sercu. As the man of my imagination had said, it was nearly closing time. Useless to try to get back that lap from Post-Sercu who had taken the precaution of building up a higher points total in case there was any such trouble from other teams. Many times during the week we had been reminded that the last British rider to win a London "Six" was Sid Cozens back in 1934. Thousands were hoping that Gowland would be the next, and I offer a few words of consolation to the disappointed. Gowland-Renz certainly did not have the entire field riding for them, but at the same time it would be idle to pretend that ten teams were all the time in violent opposition. When their late dramatic raid was at the critical stage with four minutes to go, for instance, Post was in command in a perfect position to tow the "peloton" back up to the breakaways as he had done so many times earlier in that final 50 kms madison. Maybe Peter Post preferred to swing up because he was tired from those efforts, or perhaps it was because he was not at all displeased to see the Union Jacks on the point of moving into second place. Indeed it must have been a pleasure for the High Master of the Six-day school to see one of his boys riding with such strength and tenacity. When Peter came to the first Skol race at Earls Court in 1967 he had quite a class of British riders to instruct. I wrote at the time that the only two who really had the makings of indoor track riders were Gowland and Hugh Porter. Each has now made enormous progress, but we must not make the error of supposing that a Gowland-Porter team riding in continental six-day events will be a serious threat to the established heads. Gowland particularly owes his second place at Wembley not only to his brilliance as a rider, but to the inspiration of being paired with such a great exponent of the art as Sigi Renz. The German star paid Gowland the highest of compliments by refusing to nurse him at any time during the six nights of racing. Whereas to an old campaigner like Renz a 50 kms madison a night was just a warming-up session, it was to the young Londoner a tough assignment, particularly in the last 15 minutes. One night in particular Renz-Gowland got up on the board level with two or three other teams with only 10 laps to go and the £350 prize therefore going to the first man over the line from those leading teams. The crowd were shouting for Gowland. but the lad, spent from the lap-stealing raid, could do nothing about it. He had to sit up in the back straight and watch the show-down on the other side of the track. This incident alone emphasises the reality of every one of the 50 km madison sessions which ended the night's programme. Such was not, of course, the case in the earlier Skol races! 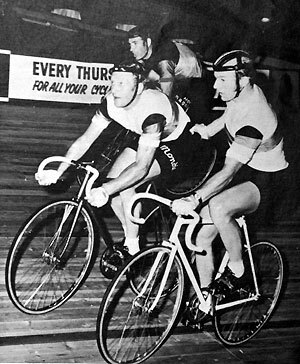 Indeed I made the point in writing about the 1967 event that veteran Australian sprinter Sid Patterson was able to finish up the week only four laps behind the leaders; at Wembley his distinguished compatriot Gordon Johnson (admittedly riding his first '6') was losing on an average 10 laps in an hour. Again, it was a simple matter to explain to a non-cycling friend what was going on in a "Chase" during those first Skol events. "See that rider sprinting away from the bunch? He's trying to gain a lap" we would say "Now he is handing over to his partner while he rests on the outside of the track. Another couple of relays and they'll be there." And sure enough they would, the bunch having conveniently - one might almost say dutifully - remained together in one line. But those madisons at Wembley, 1970, were a different cup of tea! When the battle was at its height there were riders all over the track and it took the utmost concentration from an experienced watcher to know exactly what was going on. The magnificent new track designed by Herr Schurmann played its part in the success of this Skol race. The first laps I saw ridden on it were by the amateurs, who for half an hour every night raced with commendable skill and spirit in a competition eventually won by Rik Evans. It was evident from this "sample" that professionals would revel in the luxury of the 160 metres bowl of speed. Whereas on the old Skol track hand-slings had been executed with caution, now they were performed with spectacular abandon. I was chatting with Herr Schurmann in the track centre on the first night when we broke off the conversation to watch a terrific set-to in the last lap of a sprint. Fritz Pfenninger was in the lead at the bell tearing round in the fashion that has won him more than 40 cars in the prime section of six-day races. This time Fritz had trouble on his hands in the shape of the world professional sprint champion Gordon Johnson. It looked impossible for even the talented Aussie to get by the Swiss express, but get by he did with a tremendous kick in the last 10 yards. "Now I can leave Wembley perfectly satisfied with my design" said Herr Schurmann "A ten lap-to-the-mile track which allows Pfenninger to be beaten from behind is as good a test as you will get." With a hard season of road racing behind him. Patrick Sercu's sprinting speed was not much in evidence, and it was Leyn Loevesyn (winner of the B.B.C. competition) and Johnson who were the stars, each being credited with a last lap of 9.1 seconds. For once Pfenninger took a back seat in a car competition, Graeme Gilmore taking the E912 Leyland car after consistently good sprinting form. Although Peter Post, still not quite sure of his fitness, felt his way cautiously in the Derny-paced races for the first few days, he was by the end of the week again the supreme master of the speciality. He had the full house on its feet on the final night with an effort in the last 10 laps which ended in Tony Gowland just being pipped on the line. I was surprised to find Gowland taking that Derny-paced race (which had absolutely no bearing on the race) so seriously with the all-important final madison following in less than half an hour. Gowland was, of course, not the only British rider the crowd had to cheer. Hugh Porter was there in his Rainbow Jersey of world pursuit champion, partnered by the inimitable Rudi Altig. Porter was shaken a bit on the second night fall which also involved Gowland, but he was most impressive throughout the week. A ten-laps track is not however, the ideal theatre for such a superb unpaved rider to display his talents and he must many times have wished himself on to the 250 metres of the Antwerp Sportpaleis. Sprinter Gowland, though, was happy enough to be at Wembley. Porter and Gowiand were the two "Aces" of the British riders in the field. The best tribute I can pay to the other two, Trevor Bull and Albert Hitchin, is to say that at no time during the chases, the sprints, the Devils, the Derny-paced events - never once did I have the uneasy feeling that out there were a couple of British riders gumming up the works with awkward or dangerous riding. Hitchin, particularly, improved out of sight compared with last year, while the big-built Bull was much more at home on the new smooth-running track. Trevor gave the crowd a great thrill on the last night by winning the "Devil” final from Rancati who proved to be one of the characters of the race. Number One showman was, however, Rudi Altig who thrilled the crowd with acrobatic switches on the banking, or amused with his mock protests on being ordered off the track after a tight "Devil" sprint. He was also involved in off-the-bike "attacks" on Peter Post, the offensive weapons including his own crash hat, a bowl of custard and a pail of water. During such clowning one night Race Director Arie Van Vliet got rather wet and sentenced the field to two extra events as punishment. One of the penalty races was a 50 laps Tempo race with 2 points to the winner every time round, both members of the teams being on the track the whole period relaying each other as in a madison. There is not space for more than these brief impressions of the fourth Skol six which was again organised by Ron Webb. I heard some criticism that the new electronic scoreboard was unreadable from some parts of the hall, the Dave Duffield - Ken Evans commentaries inaudible. There were one or two jerseys mixed up, too, and my own pet complaint had not been attended - the names of the occupants of the track-side cabins were not displayed. Some said, too, that "there wasn't quite the atmosphere"' or "the spectacle wasn't as good" as in previous years. But for those who judge a six-day race, as I do, by the intensity and seriousness of the madison sessions, then the 1970 Skol International was easily the best of the four.